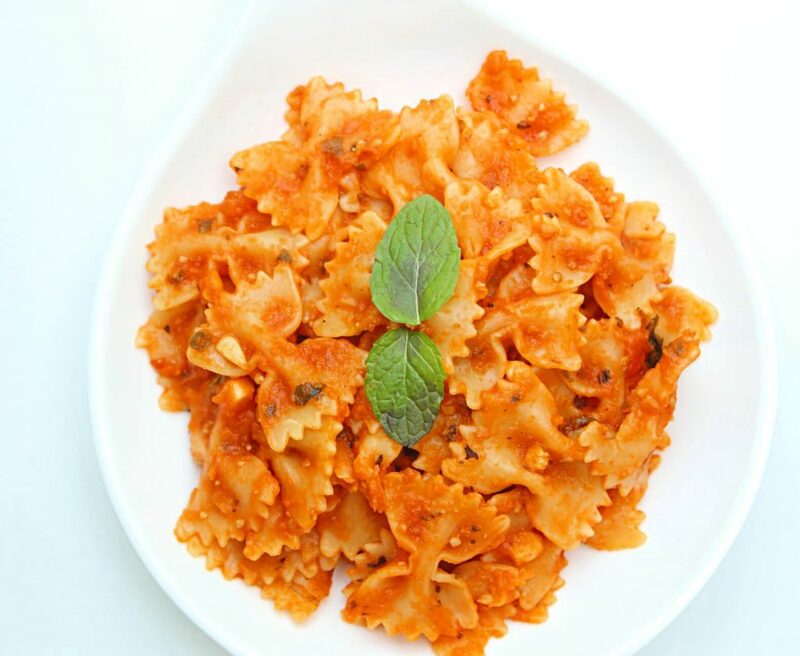 Roasted Tomato Pasta : Pasta cooked in a sauce prepared using roasted tomatoes, garlic and mint! Pasta is one of my most favorite meals. It’s ideal as a snack. It is also perfect as a complete meal. It can be prepared in a a number of ways, using different sauces, spices, vegetables, seasonings etc. It is perfect for those times when you want to eat something delicious but don’t want to cook a difficult meal. 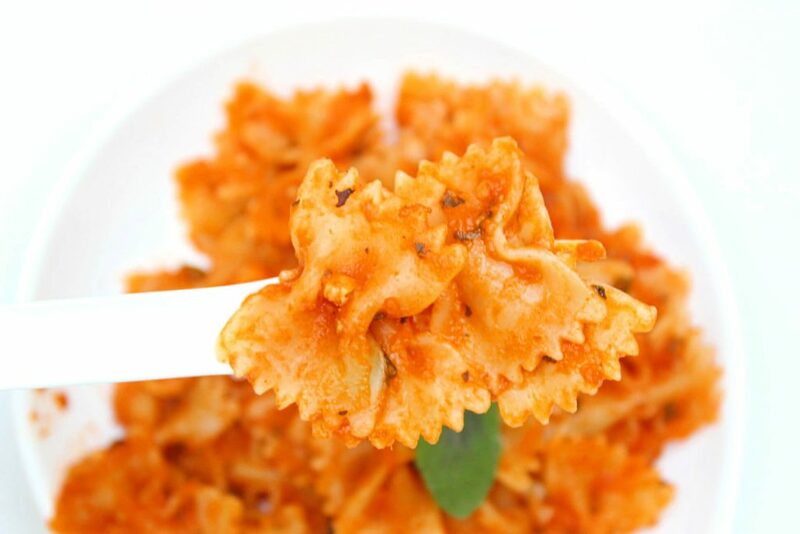 Pasta is also ideal for lunch boxes. 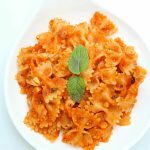 Kid’s love pasta and you can even incorporate healthy ingredients into the pasta if you want to make it a healthier meal. Today’s recipe is quite simple. But the flavors of this recipe are authentic and delicious. 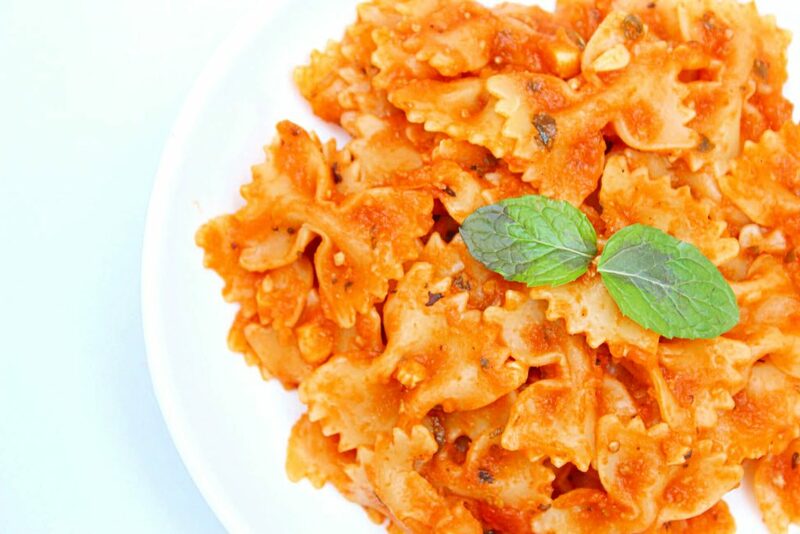 As the name suggests, this pasta recipe uses a sauce prepared by roasting the tomatoes. Roasting the tomatoes give a nice flavor to the pasta sauce. 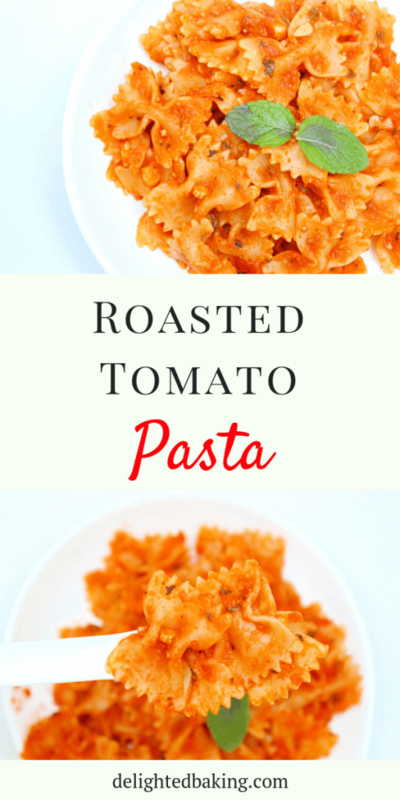 You can use this roasted tomato sauce in other ways also. For example, you can apply this roasted tomato sauce instead of the regular roasted tomato sauce on the pizza base. Or you can use this roasted tomato sauce while making a lasagna. You can roast tomatoes for this sauce in two ways : Ina n oven and on the gas stove. For roasting the tomatoes in an oven, preheat an oven to 400 F / 200 C .
Grease a baking tray, Cut the tomatoes in slices. Place the tomato slices on the greased baking tray. Sprinkle some salt and olive oil. Bake for 35-40 minutes or till tomatoes start to shrink. Allow the tomatoes to cool down. Add them in a blender jar and blend till a smooth paste is formed. The roasted tomato sauce is ready. We will use this sauce for making the roasted tomato pasta. Another way to roast tomatoes is to use a gas stove. For this, take a tomato and insert a knife into the center of the tomato. Switch on the flame. On a medium flame, roast the tomato. Hold the knife carefully and keep rotating the tomato on the flame. Roast the tomato till you see black charred marks and the skin of the tomato starts to pull away. In the similar way, roast all the tomatoes. Roughly chop the tomato. 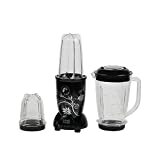 Add into a blender jar and blend them into a smooth paste. I have used the regular size tomatoes for making the sauce. If you want, you can use cherry tomatoes as well. The process for making the sauce would be the same. You can use either the oven method or the fire roasting that is the gas stove method. And you don’t need to slice the cherry tomatoes (if you are using the oven method for roasting the tomatoes). Just spread them on a greased baking tray. Sprinkle some salt. Add olive oil and bake them in a preheated oven. If you are a cheese fan, then you can add cheese in this recipe. I haven’t added cheese as I wanted to cook the pasta in authentic roasted tomato sauce only. If you want to add mozzarella or Parmesan cheese, grate and add the cheese at the very last. Just before serving the pasta, add the cheese. Another important flavor in this recipe is of mint. I have added a good amount of mint leaves in this pasta recipe. 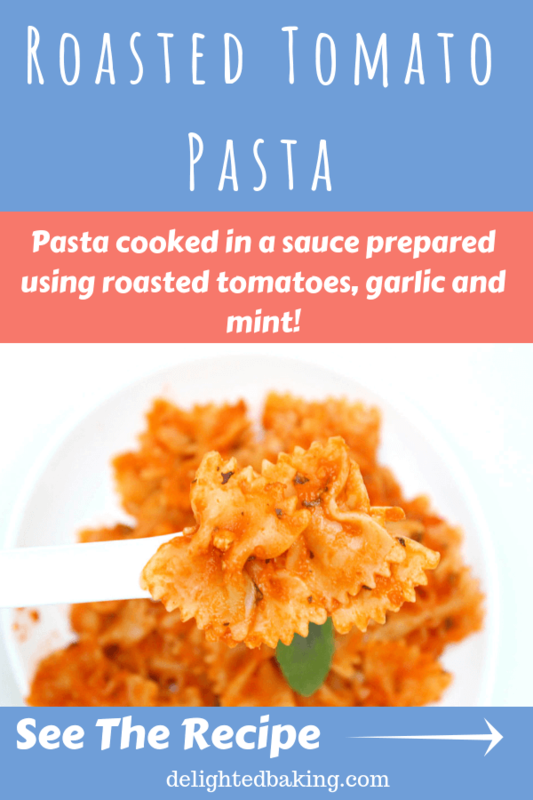 Mint gives a beautiful flavor to the pasta and it blends well with the roasted tomato flavor. So, let’s see the full recipe. 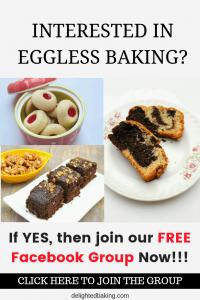 Do try this recipe and if you have any questions, feel free to ask them in the comments below. 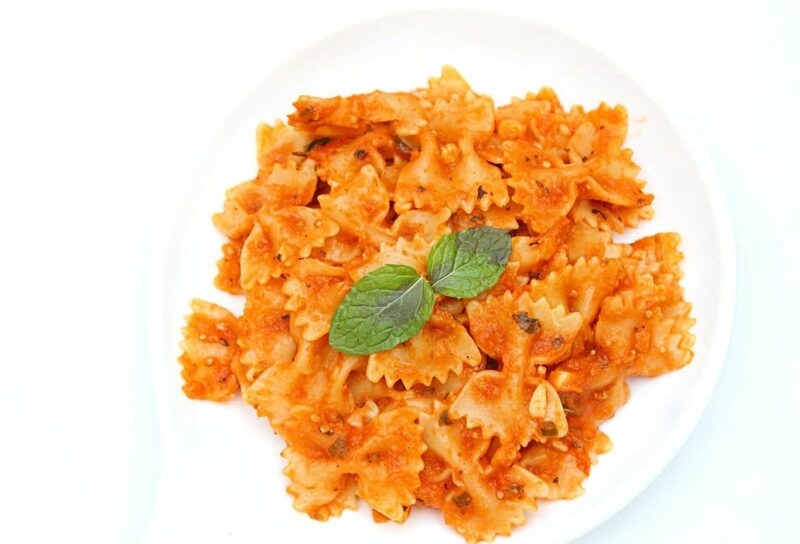 Roasted Tomato Pasta : Pasta cooked in a sauce prepared using roasted tomatoes, garlic and mint. Roast the tomatoes using either the oven method or the stove method. (I have described both the methods above). Allow the roasted tomatoes to cool down. Roughly chop them. Add them in a blender and blend till a smooth paste is formed. Take a wok or a deep bottomed pan. Add oil and heat it. On a low flame, add the butter. Heat it for a few seconds. Add chopped garlic and green chili. Saute for a minute (Keep the flame low). Add Italian seasoning and basil. Mix and cook for a few seconds. Add the prepared roasted tomato sauce. Cook it, on a low flame, for 5-6 minutes. Add salt, pepper and mint leaves. Mix well and cook for a minute. Now add the pasta and water. Mix nicely. Cover with a lid and cook pasta for around 10 minutes. Roasted tomato pasta is ready. Decorate with a mint leaf and serve hot! If you want, you can add vegetables of your choice - baby corn, sweet corn, chopped capsicum, olives or mushrooms. You can use any variety of pasta for this recipe. Join our Weekly Newsletter for receiving new recipes straight into your inbox.